Dan Eldridge has been writing about travel, entrepreneurship, and American pop culture for nearly two decades. He has co-authored four other guidebooks and founded Young Pioneers, a travel magazine that was nominated for an Independent Press Award by Utne Reader. Dan has worked as a staff editor at Pittsburgh City Paper and as a copy editor at Philadelphia Weekly. His work has also appeared in the Daily Telegraph, Houston Chronicle, Miami Herald, Paste, and Seattle magazine, as well as nearly every major Pittsburgh-based publication. Dan is originally from the San Francisco Bay Area, but he has lived in six different states and three different countries, including Turkey, where he taught English and worked as an editor for a backpacker’s magazine in Istanbul. 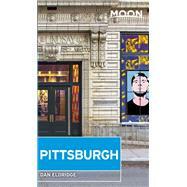 Pittsburgh, however, will always be his home; it was there that Dan graduated from Peters Township High School, studied journalism at the University of Pittsburgh, and launched his writing career with internships at Pitt Magazine and the Pittsburgh Tribune-Review. Dan is currently based in Philadelphia with his fiancée and their four cats. He’s in the process of relaunching Young Pioneers as both a print magazine and a publishing company for the creative entrepreneurial community.